I have been interested in urban foraging since I first read about the concept. Who would not want to walk around their neighborhood gathering fresh food, saving the environment, and having fun? Alas, the opportunity to move to Portland and pick wild berries did not present itself, so I waited. Until one day I saw a weed. 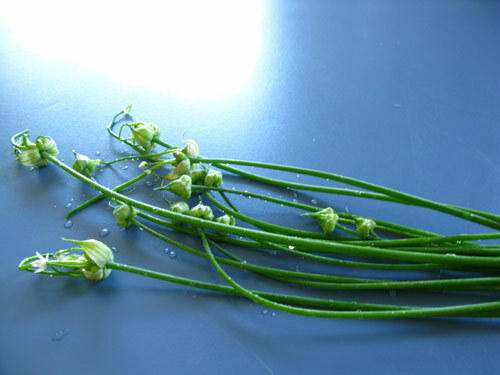 And my husband said “yum.” So we started picking wild green onions, or chives, or whatever you want to call them. I am hardly an expert at urban foraging, but here is what I have learned in the past month. Be careful. Urban foraging should help you avoid pesticides and other nasty chemicals related to conventional farming. But there are still risks from cars, dumping, and even animals. Check for suspicious residue from oil or antifreeze, never taste before thoroughly washing, and always use common sense. Be conscientious. 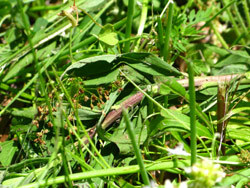 After making certain that you have the right to forage in your preferred spot, you still have to take care of the land. Do not over-forage, destroy plants, or interfere with any animals- even if they are pesky pigeons! Be fast. It is obvious that plants grow and fruit ripens quickly, but when it comes to urban foraging there is also the risk that what you see as a garden paradise may be seen as a mess to be cleaned up by city workers. 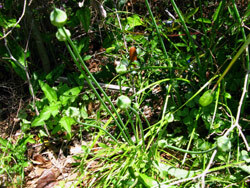 The other day I saw some wild onions by the side of our street. The next day I returned to pick some, only to find that workers had just come by to trim the weeds! Since I was there right after the city workers I was still able to gather some of the “pre-trimmed” green onions. 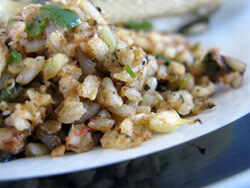 They were a bit yellow from the sun, but worked perfectly in Spanish rice for lunch. So far my (sub)urban foraging efforts have been limited to green onions and berries, but I hope that it will eventually be a regular part of my life. After all, urban foraging is good for the environment, good for your health, and good for the budget. What is not to like? Do you have any tips for urban foraging? No suggestions, but encouragement! 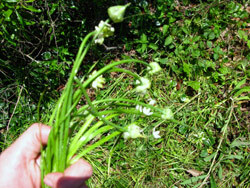 When we went bicycling last weekend the smell of wild onions was everywhere, and I second your husband: Yummm. We also have wild blackberries in our back yard. Well, behind it. We pick them every year. You’re much more knowledgable than me, but the spanish rice looks incredible! Yum! Berry picking is so much fun, and relaxing too! Any berry pies on the menu?? Haven’t heard of this. I love your photos!